The website of the Tiverton Town Team - this website was provided free of charge. Promote Tiverton to the tourist attractions to get the tourists to visit other attractions nearby and also Tiverton Town itself. It’s not glamorous but improved signage works. Signs to Tiverton to be more attractive & signs in Tiverton to be more helpful. Establish and promote a town centre coach park to encourage touring companies & day trippers to come to Tiverton. Schemes to encourage for residents of Tiverton & the surrounding villages to choose Tiverton for their weekly shopping. Tiverton is the gateway to Devon, surrounded by over 20 major attractions within the same postcode. Unfortunately, as many towns, we do not have a town centre coach park or indeed anything close by. This is a wasted opportunity as we lose those potential visitors. Getting visitors to vist Tiverton - A Coach Park! If visitors to the attractions travel by coach then there is no option for them to visit our wonderful, historic and beautiful town. 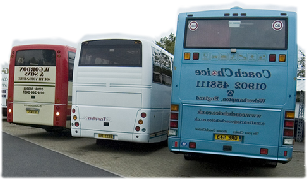 The coach operators just don’t have Tiverton on their itinerary - if its too hard to get the visitors dropped off and picked up they simply wont do it. So the visitors get driven to other destinations to enjoy and they miss out on our lovely and historic town. We do have a challenge with space in the town. There is an option for parking coaches within the Market car park, but this has to be booked in advance and as its a very busy car park with a lot of foot traffic its not ideal. Hence it is rarely booked and rarely used. There is land behind Banburys department store and they are willing to remove their oil tanks, reposition their car park and allow up to three coach’s to park. Sept 2012: There are some issues highlighted by the Highways Department regarding reversing coaches in this area but as Argos, Banburys, Marks and Spencers and Superdrug all have huge delivery lorries parking, unloading and reversing in the same area this should be able to be overcome. following the town meeting in August, we are also actively looking at alternative sites but as yet (Sept 9th) there are no available or appropriate land spaces available. If you know of somewhere then please use the contact form to let us know the details.